RANDOM ACTS OF WELCOME MAKING THE WORLD A LITTLE SMALLER, ONE HELLO AT A TIME. A photo blog of random people around the globe. People you may pass every day and never notice. It's a big world out there, lets make it a little smaller in here. Drop by often and say, Hello! His Twitter followers are dizzying! At over 380,000, Bobby Umar has a lot to say. And a lot of people flock to him to listen to what he has to say. A husband, father, motivational speaker, author, coach and online sensation, Umar’s long journey from the corporate grind to connecting with family, friends and a multitude of audiences, has connected him to his audience. Umar is a charismatic and affable man for whom people eagerly purchase tickets to hear, read his books and hire for corporate engagements. He is also a man who has strived for his own perfect work/life balance, and thinks he might just have found it! Born in Saint John, New Brunswick, Umar worked for Bombardier after his engineering degree. This life was not fulfilling, so ever the entrepreneur, he developed an online theatre group that grew from two people to 150 in four years. Wishing to take this further into film & television, an MBA was thought to be the right direction. He had few contacts in film, so moved into marketing where work was punishing. “I was young, so I could do it”, Umar laughs about hours he worked for Kraft and then the Real Beauty” Dove campaign which he enjoyed. “At some point I realized I was working 60-80 hours a week for the man, and not for me”. Umar wanted a family and a work/life balance that aligned with who he was. It was at this point that friends convinced him to use his natural skills & talents to become a motivational speaker. Ten years on, he has a home and family in downtown Toronto. He has finally found what aligns with who he truly is. His corporate experiences have brought him to a place where he is connecting people, speaking, coaching and writing books that help others realize who they are and what there potential can be. His coaching is primarily for people transitioning from a career, into an entrepreneurial life, helping them take control of who they are and what their brand is. The subjects of his speaking engagements vary but the underlying messages are clearly focused on personal branding, digital & personal influences and networking, “Things that everyone wants”. He is currently MC at the National Speaker’s Bureau convention in Vancouver where he is also delivering his “Best 20 Minutes” on networking, how vital personal & digital connections are for everyone in the marketplace. To say that Bobby is skilled in multitasking is an understatement! During the drive from this photoshoot, he spoke of his career path, his children, his upcoming engagements, all the while dealing with issues at his children’s school on his cell phone! During it all, the smile never left his face, or the sparkle in his eyes. He is motivated and happy – and all who come near him, leave walking a little taller. overhead is clogged with people who must endure their daily grind. Jennifer Huggins, the 32 year old heart and dynamic soul behind the Fight To End Cancer has had a busy year! During the past year, Huggins, together with her partner, Virgil Barrow, the most recent of 52 boxers and a staggering number of volunteers helped raise $500,000 for cancer research for The Princess Margaret Cancer Foundation to date. The money raised was the result of a year of training for the five boxing teams which culminated in the 2016 Fight To End Cancer gala held at the Old Mill n Toronto. A frenetic multi-tasker, Huggins continued to work with an international stage magician, oversaw operations at her boxing gym and managed the Fight To End Cancer preparations all the while travelling internationally as a boxing referee and judge around the world. The International Boxing Association called upon Huggins to be a judge and a referee at international boxing events including Olympic qualifying fights in Rio de Janeiro. She was also sent to officiate in Cameroon, Bulgaria, Venezuela, South Korea, Taipei and Kazakhstan. To say this would exhaust anyone would be an understatement, especially given the fact that her life in boxing came about after a broken neck sidelined a blossoming career as a competitive figure skater when she was only 14 years of age. Recently, Huggins has become involved in working with youth and women, focusing on self-protection and self-defence. She empowers women by instilling in them the courage to speak out and prevent situations from becoming problems while giving them the skills to protect themselves. 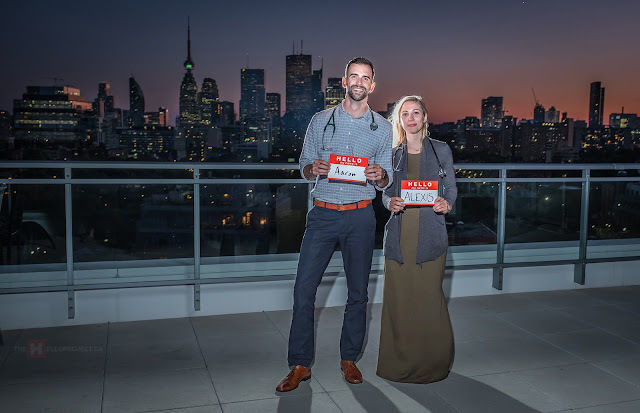 Taking a break from 30-hour shifts, around-the-clock patients and their specialties in Family Medicine, Aaron and Alexis come for a visit in Toronto. Entering their last year of residency, these two young people will soon be deciding in what community they will live, settle and begin serving patients. The Hello Project congratulates these two newly-minted doctors on completing many, many years of study and dedicating their careers to helping others. A smile and heart as big as her home country of Brazil, Juscione Souza, 36 moved to Canada at the age of 24 to be with her husband. Married in Brazil, Juscione's Brazilian husband moved to Canada for work a year before she arrived. In Brazil, Juscione worked in clothing sales where she blossomed. "I'm a little shy at first, but after a little while, I love to talk to the customers and help them with making choices and picking things out for them," she says of the joy she gets with working with people. A career move took her from sales, into nursing. After training as a nurse in Brazil for two years she moved to Canada and continued her training. Her training as a nurse in Toronto stopped when she became pregnant with her 10 year old son, Wendell. At the mention of his name, she beams, obviously a very proud mother. Juscione and her family have no other relatives in Toronto, so it is with great excitement that they travel back to Brazil, infrequently, to visit her large family. "It's a lot! 10 siblings, is a big family" she says laughing at the size of the family in which she grew up. "I love to talk to people," Juscione says of herself. She is well suited for a job where she has the opportunity to get to know people. She currently is a full-time cleaner in a downtown Toronto condominium. It is a job that never seems to end and a job where she meets and chats with people, while never stopping what she is doing. With an uncontrollable smile, Meghan Pelley is one of those rare people who love their job so much, she does not hold back when she says she has, "The best job ever"! As a groom, Meghan takes care of the breeding horses and racing stallions. "I love it, I can't imagine doing anything else," she says of her eight years at the stable and her passion for horses. Mehgan has her own horse boarded about 10 minutes away. Her horse is a "hunter" which is a sport horse that jumps fences, unlike the jumper competitions one would see at the Olympics. Hunters have to be perfect throughout the year at competition and points are awarded cumulatively, not by individual competition. "You can take your time, it's all about accuracy, not speed," she describes as one of the differences between hunter and jumper competitions. "Mr. Scotty is my favourite! He has such a personality. As soon as I come in every morning, he's the first to greet me with really loud excited neahs! He's super obnoxious," she says laughing as she describes the 14 year old thoroughbred while he stands nuzzling and playing with her. Having to retire early, Mr. Scotty is a breeding stallion who has produced several very successful offspring who also share the same private stable of 100 horses. MOST PROUD MOMENT: "This year I came second in the A-circuit competitions this past year, I'm pretty proud of that"! 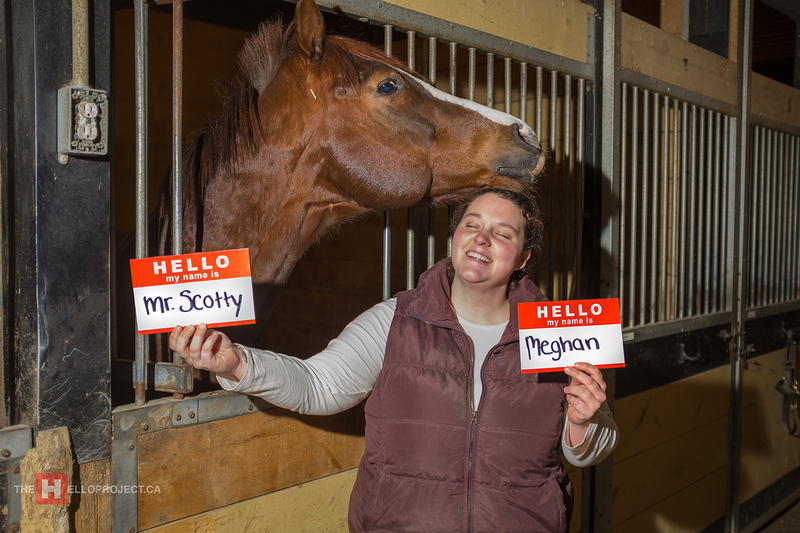 With feed, just out of reach of some of the horses, she tickles Mr. Scotty's nose and says good-buy and continues with the dream job of a lifetime. As comfortable shopping for a fine meal with the perfect wine as he is designing & building precision custom installations for high-end clients such as Dior, Bruno Girardet is a man of many talents and passions. Born in Vevey, Bruno still calls Switzerland home, living in Lausanne. With a degree in art and design from the Centre d'enseignement professionnel de Vevey, Bruno has used his love of building and design to create high-end installations for some of Switzerland's most elite shops. In addition to his contemporary design, he also is involved with preserving Switzerland's past using state-of-the-art computerized monitoring equipment to measure building movement and changes in humidity. In a country with high standards for building and preservation, some of the sensors are designed to look like traditional building elements so they are not offensive to the eye! Now, that's good design! 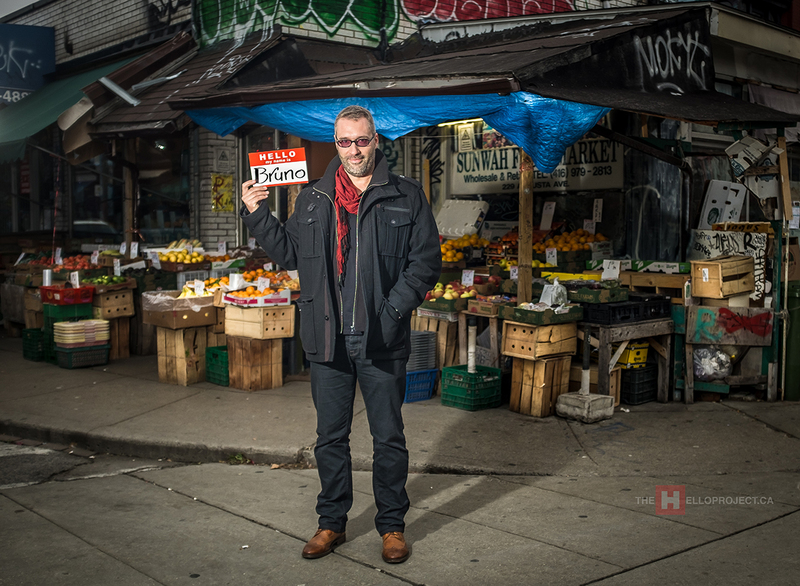 Here, Bruno is pictured in Toronto's Kensington Market to select just the right ingredients for a memorable feast! BRUNO FUN FACT: He has been trained and is a card-carrying pyrotechnics expert! Bruno can design and set off a 20-minute fireworks extravaganza from an off-shore barge that will light up the sky with over 20,000 fireworks! A man of many talents indeed! "I go and work in the mines every day," says Annick Foretay of her job working for Switzerland's only mine. It is a salt mine and she is the marketing manger at Sel Des Alpes which has been operating in Bex, Switzerland (pronounced, 'Bay') since 1554. Born and raised in Lausanne, Switzerland, 47 year old Annick lived in Canada working as a marketing specialist. In 2003 she returned to Switzerand work for Diageo, the world's largest spirits company which owns brands such as Baileys, Gordon's Gin, Smirnoff vodka and Guinness. As the marketing manager of Sel des Alpes, Annick is responsible for the way their salt is marketed to other businesses and to consumers. The salt mined at the Bex location is extracted by liquifying, then recrystallizing it for industrial uses such as road salt and de-icing. As well, the more refined product is sold for household consumption and cosmetic uses. It can also be tasted in a range of Swiss salt chocolates. ANNICK FUN FACT: While living in Canada, and one to never shy away from new experiences, Annick headed north to the French River, four hours north of Toronto to experience her first canoe trip with a small group. With a broad grin and eyes wide with wonder, she was a natural paddling the white water of the rapids and came through without dumping and wanting more. All images and word copyright: Spencer Wynn 2015. Simple theme. Powered by Blogger.